Hello Fawn Friends! If you've read the "About Me" category of my blog or follow me on social media, you've probably noticed my love for God, that I am a Christ follower and true believer in Him and His Promise. Not to go into my testimony or anything (maybe later), however I have experienced and seen His handy work in my life way too many times to count, not to fully trust in Him and His plan for me. Not to say my life has been a cake walk and still isn't, however knowing that I give complete control to Him gives me peace of mind knowing that through God, all things work together for the good. My goal, my purpose and my responsibility as McKenzie's mother is to lead by example and show her what it looks like to Read God's Word, Learn God's Word, Live God's Word & Be Active In God's Word. 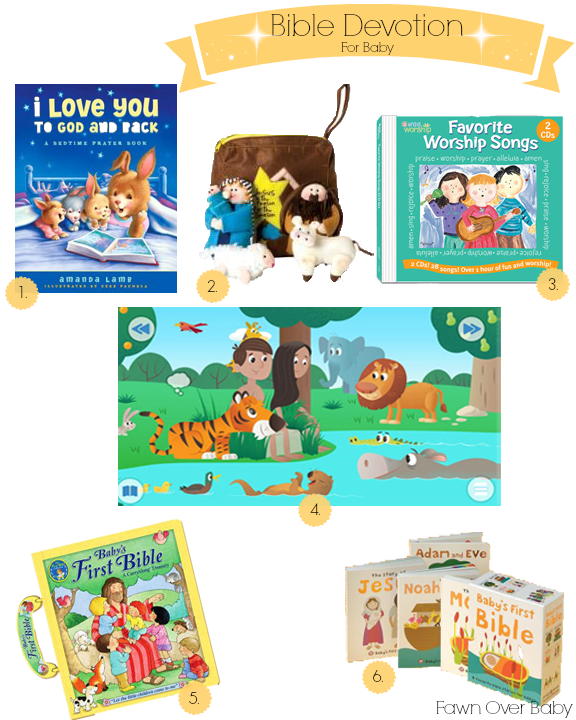 What better way to lay that foundation than to Teach God's Word in a way that she will enjoy through child-friendly bible teaching activities, stories, games & toys. Well, today I wanted to share with you a few items that McKenzie happens to love and/or we plan on adding to her bible devotion collection. 1. "I Love You To God and Back" By Amanda Lamb - We do not own this book, however, it will definitely be next on our list to add to McKenzie's collection of devotional books. This Book is a wonderful way to have fun with your little as you go through their nightly routine: "teeth brushing, story time and one more glass of water" then transitions into teaching your little how to pray: "love God, Ask Him for forgiveness, Thank Him for many blessings and offer requests". As I'm slowly getting Kenzie used to a bedtime routine, this book would be the perfect way to send her off to sleep thanking God for all that He has blessed her and her family with. 2. Roman 6-Piece Plush Navitiy Scene - This is a great way to introduce your little to the story of Jesus all year round. This all cloth navitiy scene includes, Mary holding baby Jesus, Joseph holding his shepherd crock, a wooly sheep and cow which can be all nestled into a plush cloth bag that reads "Jesus is the Reason for Season". McKenzie is so into dolls and figurines right now, so I know she would be delighted to watch and learn as my husband and I use this set to "display the most holiness of nights long long ago". 3.Favorite Worship Songs: What baby or child does not like a little music to help along the learning process. I remember my mom used to turn everything into a song to help me remember our address, spelling words, sometimes even math problems. McKenzie mostly just gabs her words now, however, when she hears her favorite song come on Baby First TV, her word rhythm goes up a notch as she tries to belt out the tune! This is going to be another item on our baby devotional list in hopes that she will use music as another way to get to know God and be reminded all that He has done for her. 4.Bible For Kids App By LifeChurch.tv: As you've probably seen me mention before, our IPAD is usually the main source of entertainment for McKenzie when we are on the road and occasionally at home. We try to engage her in actual toys(go figure) while we are at home as I know she would be on the IPAD literally all day if we let her. This app takes your child through all the main stories of the Bible in a fun interactive way. The Narrator walks the reader through each story with beautiful illustrations that move bringing each character and story to life. McKenzie's favorite is touching each animal on the screen to hear their respective sound. This app captivates children and adults alike and it is a good reminder that we are not our own, we are His. 5. "Baby's First Bible" By Sally Loyd Jones - This is one of three baby friendly bibles we received as a gift and couldn't be happier that McKenzie has a variety to choose from. This board bible book is perfect for your little who likes to chew on the corners or is a little rough turning the pages. This bible book conisist of "carefully selected stories, timelesss verses, and delightful rhymes taking readers on a journey from creation to the resurrection. The amazing full color illustrations by Colin & Moira McLean help bring the pages to life to create an easy bible storybook. 6.Baby's First Bible Boxed Set By Roger Priddy: This collection of four bible stories was written and illustrated and constructed specifically for infant and toddlers in mind. This board book collection is written in simple narrative and colorful illustrations that include sparkly foil on the pages to "capture their attention and hold their interest". With four stories included: Adam & Eve, Noah's Ark, The Story Of Jesus, The Story Of Moses, these books would be another wonderful addition and a great way to lay the foundation for a lifetime of faith-filled devotion during each stage of a child's young life.